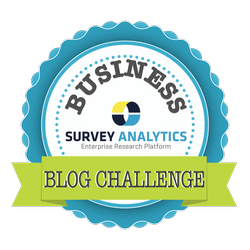 SurveyAnalytics Blog: Day 2: If You Could Ask Your Customers One Thing, What Would it Be? Your customers are a wealth of knowledge. Are you using it to your advantage? When all is said and done, they are the sole reason you are in business and you should be constantly striving to serve them. You should already have a thorough understanding of their wants and needs, but if you do not, today we are pondering the act of asking your customers one question... and what that question would be. We all have different duties and needs in the business landscape, and we all may have a different question in mind. First, ask all of your departments what they would like to learn from your customers and what their role is in ensuring a positive customer experience. See if there are any trends or commonalities in the questions and rewrite the ultimate question your business wants an answer to. Most importantly, ask your customers this question! There is often fear of negative feedback, but all feedback is good feedback and shows you are listening and putting the heart of your business at the customer’s needs. At the end of the day, your customers are the most valuable asset in keeping your business afloat. We often form a very strong and long-term relationship with potential clients to listen and understand their needs before they become an active customer. One of the biggest challenges we face is when we are treated like a transaction. There is a lot we can do and we have the development strength to customize and enhance our customer’s experience much further than our software being “sold as is.” We have an industry experienced Customer Success Team dedicated day in and out to making our partnerships stronger. The hardest part is making sure our customers talk among each other and to us for fulfilling these related needs. Our most important question we connect and ask our customers is this: Are there additional ways in which our two companies can work together?